One man’s home AND prison. How shocking it must have been for Pu Yi to have suddenly be forced out of his home – the only place he ever knew – into a world he had never seen of or experienced for himself. Such a pity – a man of his ‘noble’ blood to have died a simple gardener. It is the place where hopes are made, politics and alliances are forged and destinies determined. 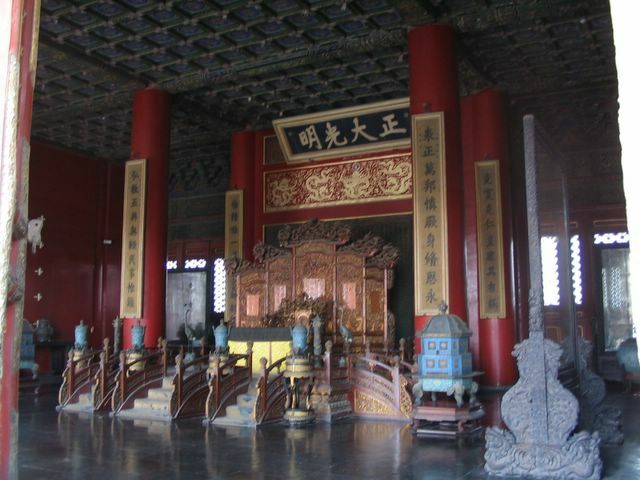 The Forbidden City – once the home of one man, thousands of his wives/lovers/concubines, and workers. Today, hundreds, sometimes even thousands of tourists swarm the place, walking through its doors – free to wander in and out as they please. A luxury that the Emperor of China never officially had until the fall of the empire. One of the regal ‘thrones’ in which the Emperor would place himself in. From it, he would rule the fate of millions of Chinese and dictate how China itself would journey into the future. Since I don’t read Chinese AND I know for a fact that this is not the golden throne, I have a faint idea as to where I took this picture (just that I forgot!) – anyone care to remind me? One of the two golden lions busy safeguarding one of the Halls in the Forbidden City. The gardens. Since the many ladies and the emperor himself could not partake of nature’s beauty outside the palace walls, he ordered them to be brought to him instead. Unfortunately it didn’t stop him from sneaking outside to partake in other forms of beauty. 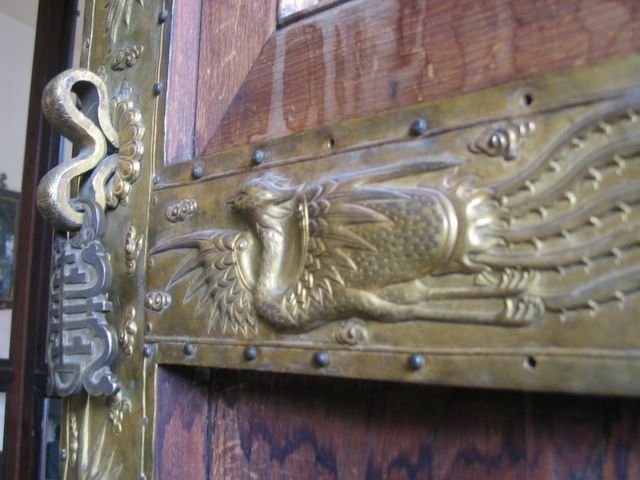 The beauty of one of the many doors that held its occupants imprisoned for many a century. 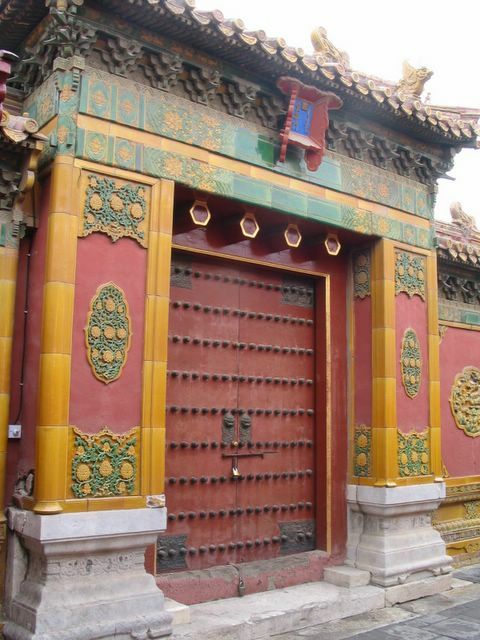 Nearly all of the doors in the Forbidden City have some sort of lock or barricade on it, testament to its ‘dark’ purpose. A closer look at the door leading to one of the more private rooms in a quiet section in the Forbidden City. A bird’s eye view of the city in all its splendour. Therefore, be warned – drunken ramblings ahead. 2. I scaled the Great Wall of China – two stations, 10km in total, from Jinshanling to Simatai. The trek through Jinshanling was fine – since a greater part of the length was already repaired but the worst came when crossing Simatai because the Simatai section is very very steep, narrow and in ruins. My muscles hurt really badly now – which makes me wonder how will things fair when Nil and I decide to go to the Hunan Mountains (in November) and Alps (in December). 3. I start work tomorrow – not so fun simply because boss decided to be a pain and email me with stuff to do over Tuesday and Wednesday knowing that I’ll only be back tomorrow – which is a Thursday. I think she needs some reading glasses. Okay…so I’m sleepy – I’ve got train and jet lag. French was a bomb today – we picked up stuff about the weather and even though it just got harder, I’m happy. At least I got to practice some very basic French with a group of retired French ladies I met in the toilet at the end of Simatai Great Wall. And am enroute to Beijing. Am fiddling with the free internet comps here just to kill time since the flight is due to take off at only 9:30am. HAVING CHILDREN DOESN’T GIVE YOU THE RIGHT TO CUT INTO A QUEUE. Especially at 7am and in an airport together with another groups of impatient people waiting to go home/holiday/business trip/etc. I should have told the guy that I was pregnant, thus have every right to be in front of him – just to show him how stupid his excuse was. So yeah…the wonderful perils of travelling. Yes, I’ll be off on my journey to the city that houses the Forbidden City and The Great Wall of China among many other wonders of the modern world. But of course, a first stop down south since this trip is completely financed by the ever lovely boyfriend. Now, don’t be jealous. Nil doesn’t pamper me with flowers, expensive gifts or chocolates. So he compensates by making sure that I destress and keep him company on holidays. He loves travelling and frankly so do I. ^_^ Plus it provides me with ample opportunities for loads of pictures like our trip to Thailand earlier this year. Anyway, I’m leaving tomorrow for Singapore and then to Beijing on Friday morning, only to be back in Singapore on the 24th and in KL (for my French class) on the 25th of May, so don’t miss me too much and have fun during the long weekend. Courtesy of one of my students, Hsin. Many thanks girl! My tank set up at work. It is right next to my computer – so quite warmed up with the hot air and what not – and it has a plant on top left and a snowman on the right for company. Sometimes it stares on the snowman’s red nose. If you look closely, you’ll see the three different stuff I feed Basil II – Daphnien, Bloodworms and the pellets. The cup is for Basil II when I change his tank water and the knife is to scope out excess food plus for dropping in softened food (I normally dip the Bloodworms in some water before feeding it to him). The yellow bottle is for water treatment. Basil II and betta care 101! Basil I committed suicide over the weekend. Hm. He was acting a bit strange prior to jumping out of the fish tank (despite my best efforts to thwart his suicide stint – I left a small square hole on the plastic cover for air and he cleared it). He flopped around on my table, I found him, place him in some water…but by the time I got to my pantry, his belly was upside down. So off he went to Fish Heaven, via the old-fashion toilet bowl method. Wonder if it is my office environment that was driving him bonkers. He was going round in circles, chasing and nipping off his own long-ish tail fin. Sort of concluded to my colleague that if this one commits harikiri (sp? ), it’s gotta be either me or the office that is driving the fish bonkers. I got another fish later that afternoon together with better fish food and some treats for the fish. Since I ran out of good names, and the fact that the new fish is also blue like Basil I, I named him after his namesake…but with a roman numeral signifying two. Hopefully he won’t jump out of the tank. So hey world, I have another fighting fish at my office and his name is Basil II. AND so far, he looks quite happy. He’s a huge eater – gulping everything and anything that I throw into the tank AND he’s blowing bubbles! If you ain’t familiar with fighting fish behaviour, when the fish is happy, they’ll eat A LOT (they are known to be piggy with food), swim around, AND they make bubblenest (this huge glomp of bubbles). I caught Basil II surfacing for air quite a number of times, proceed to open his mouth bigger than usual (like a yawn) and blow a couple of bubbles out. He associates this white plastic knife I have with food but flares up at my finger. Funny but anyway, he’s more active than Basil I and definately a lot more fun to watch. So here’s the 101 lowdown on betta care, even though you can get more info from sites like this here. Note: I’ll try my best to get some pictures soon. Lord knows how long my camera has been out of commission. So what do I feed him with? I settled on the following: Hikari Betta Bio-Gold pellets, freeze dried Bloodworms and freeze dried Daphnien (they look like mini fleas). Unlike Basil I (which abhhors pellets and loves bloodworms), Basil II actually loves the pellets and Daphnien but takes a while to adjust to the bloodworms. I don’t go for live or frozen because I read that it can be very dirty and unhygienic not to mention dangerous for the fish – more risk of catching some disease or parasite. Freeze dried food is great but don’t feed the fish too much (just one or two pellets/Daphnien/bloodworms is good enough if you’re feeding it twice a day) or it’ll get constipation or sick. Where is a good place to get supplies for Bettas (fighting fish) per say? While, in general, all aquariums will stock these things but so far, the most helpful place I went to (plus the cleaniest and treats their fish well) is this aquarium store in SS2 – the same row as Maybank but behind and facing the main road. They stock tanks, set-ups, food, fish (of course), assoceries and a whole load of other stuff PLUS when they handed over Basil II to me, they pump in oxygen into the bag – unlike the other store where I got Basil I (they just emptied him into the plastic bag and handed him over to me). What’s my tank set-up like? No jam jars please! It’s only fair that you treat your pet with some consideration. Just imagine yourself living in a closet. Hardly fun, ain’t it? So a good sized tank with a cover (if it doesn’t come with one, just make your own with transparency film and paper) is good enough. Mine is about 8 inches tall by 8 inches wide and 3 inches in depth. Bettas love some foliage – just so they can rest on the leaves and hide behind something when you coming looming in to watch them. Live plants are hassle, not to mention dangerous coz it introduces bacteria and what-nots into the water…so get some fake plastic but make sure they don’t have metal or scratchy bits that can destroy/shred betta fins. Gravel is an option, but I like it coz it makes the tank look so much more cosy and prettier. If you are planning on getting a betta for your office like me, a termometer would be a good addition – just so you can check for temperature fluctuations. This is important as bettas don’t do very well in cold environments even though they are a hardy bunch. Anywhere between 24 C to 30 C is good for this tropical fish. If it drops below, the fish becomes more lethargic and will lose its brilliant colours. It might even stop eatting. Tap water is good but get it treated – chlorine can kill your poor little fish. I use Tetra AquaSafe for the water in my tank set-up for Basil II. I usually change 100% of the water every three to four days – since my tank is quite small and therefore gets dirty faster. Dirty water means lower immune system for the fish and thus more possibilities of containing diseases. I also rest water for about 15 minutes before placing Basil II in the tank to acclimatise the water temperature and gas content – I’ll scope him up in a cup/container with a bit of his old water. Studies have shown that pet owners have lower blood pressure and are well…more relaxed than non-pet owners. It doesn’t matter if you have a cat, fish or even bird. Animals have this strange yet wonderful capability of just bring a smile to our faces and brightening/relaxing our day. After having put some thought into seriously de-stressing myself, I succumbed to my more ‘natural’ instincts and got myself a fish – a Siamese Fighting Fish, to be exact – for my workstation/office. Someone suggested getting a hamster but I felt that it was pretty high maintainence, required more space (which I don’t have), AND it could stink up the place. Did I fail to mention that the hamster could get more stressed out with all the traffic than me??? So fish it was…and fighting fish – simply because they are quite a hardy species. Watching it swimming around and getting used to being in a big tank (it was previously in a jar) made me smile and honestly, it made me more relaxed. But I felt that the tank was too bare, especially more so after reading about how fishes prefer some cover to hide in case they get scared or stressed out. So after French class this evening, I went out and got a couple of plastic plants (just two because despite how it sounds, my tank ain’t thatttttt big!) and a termometer for the tank – just to check if the temperature gets too low for Basil. Yes, I name all my pets…including my fishes and runaway turtle. ps: Pictures will come soon once I get batteries for my camera. LOL!